In order to explain how a cartoon moves, we will look at a piece of motion picture film. Each foot of the film has sixteen individual photos that are a little larger than a postage stamp. These tiny photos are quite similar to the kodak pictures except that movies are finished on transparent celluloid. As a movie camera photographs motion, the movement is recorded as a series of progressive poses. For instance, if a person is photographed while walking, the camera “shoots” the action as a series of different poses. When these various poses are projected to a screen at high speed, the individual pictures blend and give the illusion of motion. There are two different sets of gears in a movie camera. One set takes sixteen pictures or a foot of film for each turn of the crank while the second set “shoots” only one picture for each turn of the crank. This last named camera is known as a “stop action camera” and is the one used in making cartoons. To create the illusion that Mickey Mouse is moving, a different drawing for each pose is needed. These different poses are “shot” one after the other with the stop action camera. While the different drawings are being changed in front of the camera, it is, of course, stopped. For example, imagine Mickey Mouse in “Mickey Mouse and the Bean-Stalk.” He is on the giant’s dinner table and the giant sees him. Of course, Mickey turns and runs. To portray this, Walt would first paint a water color of the dinner table. Next, he would draw a cartoon of Mickey Mouse which would then be traced to a sheet of celluloid. 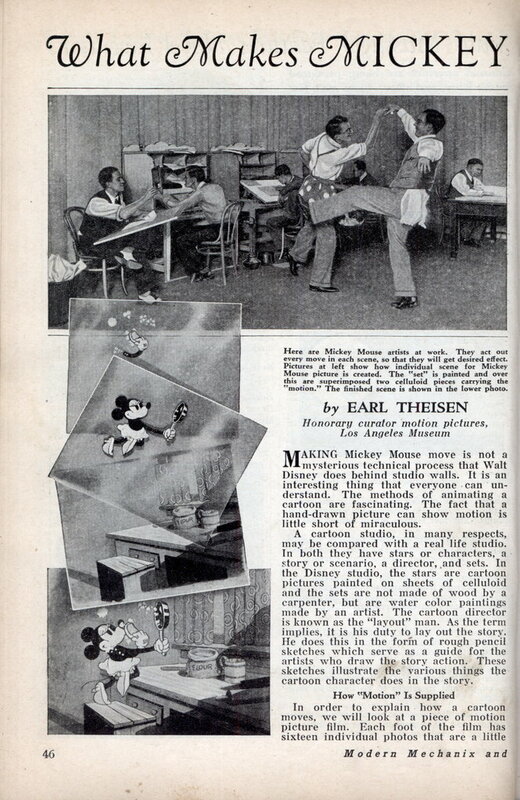 When this celluloid cartoon is laid on top of the table painting, Mickey Mouse appears to be standing on the table. This picture of the Mouse standing on the table is photographed. Since Mickey is to run away from the giant, the next cartoon drawing would be of Mickey with one foot off the table in a position wherein he is starting to run. This last picture is now substituted for the one already photographed on the table. Walt would continue to draw Mickey Mouse with first one foot off the table and then the other as he runs away from the giant. These pictures would be photographed one after the other on motion picture film with the stop action camera. In this picture Mickey runs and hides in the Swiss cheese. To show him running to the cheese, it would be necessary to draw about fifty different poses. When these pictures are projected in a theater at high speed, they blend together and give the illusion that Mickey Mouse is running. It must be remembered that every bit of action in a cartoon is drawn as a set of progressive poses. Of course, to do this a great number of drawings are required. Walt Disney and his staff draw from 10,000 to 12,000 individual drawings for each cartoon movie. These are viewed on the screen in about seven minutes. That seems like a lot of work for only seven minutes. It is no simple matter for fifty artists, all working on the same movie, to have their drawings similar. The technique of all the artists must be the same, otherwise the movement and character of Mickey Mouse would vary. In order to standardize the drawings, the artists go through a period of training of about six months. The cartoon scenario is the result of a “gag – meeting.” When a story idea is thought suitable for a Disney cartoon, everyone from the janitor to the studio cat knows about it and submits ideas or gags. The cat submits gags in the way of antics and stunts. Every idea is considered. The result of this meeting is a cartoon scenario. In it may be ideas and stunts from perhaps a dozen of the Disney tribe. They have been thoroughly gone over under the close supervision of Walt until they are Mickey Mouse. The cartoon scenario is not like the conventional motion picture scenario. It differs in that it is really two manuscrips in one. One part tells the story or action for every inch of the film while the second part notes and describes the corresponding music and sound. These two parts are carefully matched by musical beats. Each beat of music requires a certain length of film and for each beat of music, the characters must do a definite bit of action. The reason for the two scenarios is because the picture part of the story cannot be photographed with sound. They are recorded independently on different films. Sound cannot be photographed by a stop motion camera, while that is the system necessary in animating a cartoon. The sound film and the picture film are later synchronized. One of the most interesting places at the Disney studio is the sound stage. Within it is a mysterious quietness. Each sound has a hol-lowness due to the sound-proofing. Off in one corner is the “monitoring” room where the sounds are judged in rehearsal. Here Walt and his musical director sit and listen to the sounds as they come to them over the circuit to the sound recorder. An imitator speaks for each of the cartoon characters. A large orchestra provides the musical score. Working with the orchestra is a group of “effect men” who manipulate mechanical devices that create the many incidental sounds. Recording sound effects at the cartoon studio is more than just interesting. It is like a scene in an old alchemist’s laboratory. You hear the director asking for a dog bark, or a dog sniff, for a kiss or shivery growl. Perhaps a door slam. The kisses are made by a musician who kisses the back of his hand A bottle and a cork in their hands can be made to sound like a monkey chattering. 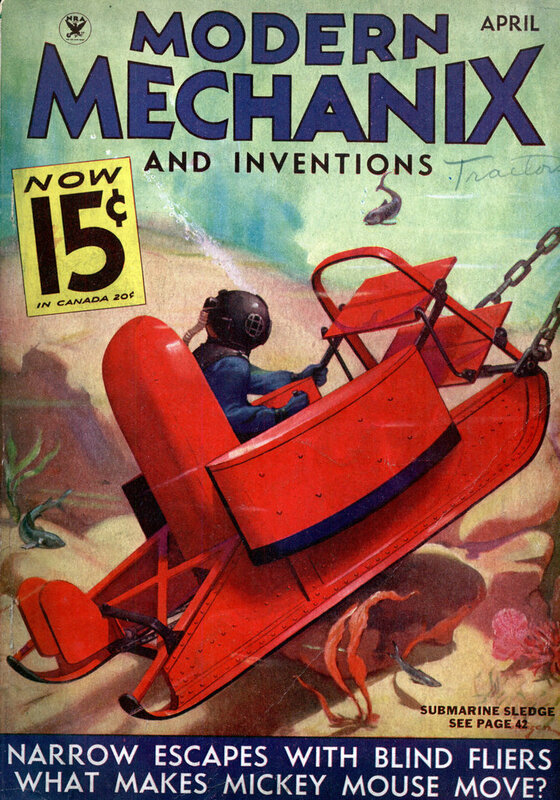 A tin car with a resin covered string sounds like Mickey’s trousers tearing. They have dog barks in all pitches, deep barks for big dogs, little barks for little dogs, and yips for frightened dogs. These sounds are made by the imitators who have specialized in voice control or by special apparatus designed for the purpose. The imitators group themselves around the microphone. On their heads are earphones through which come rhythmic ticks that serve to keep them in time. It is a guide that tells them when to begin their lines. By previous rehearsal, they know that at a certain point, as represented by the ticks or beats, Mickey Mouse is saying something. So the conversation must punctually begin at that point. This is the time to again point out that the picture film is being recorded in another part of the studio on another film. They are not recorded on the same film. The sound recording camera “shoots” ninety feet of film per minute while recording the sound and the cameraman on the “stop action” camera is lucky if he gets fifty feet of film in a whole day. He is delayed because he must tediously change each pose before it can be photographed.